As I write, my baptism certificate and a few photographs from that day in February of 1953 are scattered on the desk next to my laptop. I look at the black and white images of my sister, brother, and my mother sitting on our front porch steps. Mama is holding me in her arms and we are all bathed in the bright sunlight of a clear winter’s day. My father’s presence is documented only by the photos themselves. He is the person behind the camera. When I look at the certificate, I see the familiar handwriting penned by the pastor who would become my father-in-law forty-six years later. These yellowing pieces of paper are treasures that my mother gave me as she sorted and sifted through mementos near the end of her earthly life. They offer a sense of grounding and belonging. They remind me who and whose I am. They shape my identity, pointing to God as the source of all good gifts. As I’ve reflected on our lesson this month, I’ve spent a lot of time meditating on the meaning of baptism, and for the first time, I noticed the verbiage of the sacrament on my certificate. After all of the names and dates are filled in, the paper certifies that a child “Received Christian Baptism”. Received. Somehow I had missed that word over the years and it seems significant. 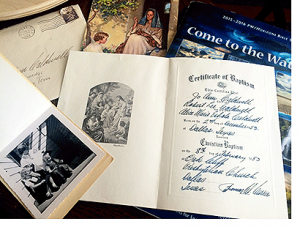 “Received Christian Baptism” is a powerful reminder that it is God’s activity in baptism. It reflects the gracious gift and love of God. We cannot earn this gift. No matter how old we are, we simply receive, and as infants, we don’t even know that it is happening. The words are powerful. Moving. Life changing. They paint a vivid picture of the scene. But beyond the content of the passage is the context in which it takes place. If we continue reading into Chapter 4 of Matthew, we see that immediately after Jesus was baptized, the Spirit led him into the wilderness to be tempted by the devil. I cannot presume to know the thoughts of Jesus, but with the placement of these two stories side by side in the Gospel, I also cannot help but think that Jesus was fortified to resist the temptations through the waters of baptism. He knew who he was. His identity as God’s Beloved Son was affirmed and strengthened. As I close these meandering thoughts, it occurs to me that we, too, can utter those words that affirm who and whose we are. Perhaps like Luther, when we find ourselves in the darkness, wrestling with pain or fears that overwhelm us, we will say, “I am baptized.” Or when we are in the wilderness of our culture and are tempted to find our identity in what we own, how we look, or what people say about us, we will stop and remember that these things do not define us. We will remember that our identity is in our source. Perhaps we can even work these words into an everyday ritual and prayer as we prepare to go out into the world, seeking to be obedient to God and to live into the call to serve as the hands, arms, and face of Christ, as our author reminds us on page 20. What if each day, as we “came to the waters” of our daily life (brushing our teeth, washing our hands or dishes, watering gardens, or showering) we developed the practice of repeating “I am baptized.” For those who have not been baptized, you might use the words “I am a child/daughter of God. I belong to God who loves me.” I wonder how it might change our nights and days if these, or similar, words became connected to our senses through the sound and touch of water? It’s going to be my prayer practice this fall. Perhaps you’ll join me. With love and a grateful heart . . .